I recently attended Irish Fintech in the Bay hosted by Enterprise Ireland, the economic development agency of the Irish Government. It was a great opportunity to meet some of the up-and-coming fintech companies based in Ireland and I was delighted to hear of the significant growth in fintech talent coming out of Dublin’s Silicon Docks, particularly within regtech and paytech. Our host, Enterprise Ireland, has invested in more than 80 fintech companies through its venture capital activities since 2016, and is now Europe’s largest fintech investor in terms of dealflow. As well as special guests Irish Government Minister Simon Harris, Enterprise Ireland Chairman Terence O’Rourke and Head of JP Morgan Ireland, Carin Bryans, we had the chance to meet with a number of innovative Irish fintechs, including TransferMate, Servisbot, Continuum Commerce, Daon, Data Chemist and Deposify. Though it might not be common knowledge here in the US, Ireland is actually Europe’s fourth largest financial hub. Most major banks have a substantial foothold there with over 250 of the world’s leading financial services firms operating in Ireland. Plus, many of the Valley tech giants have built their European homes there, including Facebook, Google and AirBnB. This is all attracting outstanding talent to the country, much to the benefit of Ireland’s fast-growing fintechs. In terms of market activity, Irish fintechs have impressive growth trajectories for the coming year. 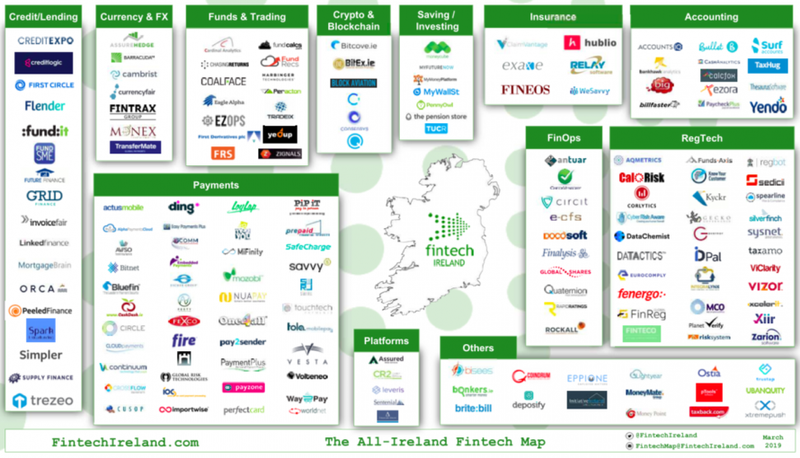 According to the Irish Fintech Census, around 1 in 5 fintechs expect to raise at least €5m in their next funding roundand 17% of fintechs expect to achieve global revenue growth of over 500% during 2019. Ireland’s top fintech sectors are regtech and digital identity (17.5%) and payment and remittances (12.7%). Seven Irish regtech businesses were included in the most recent RegTech 100 list: AQMetrics, Corlytics, Fenergo, Governor Software, RegBot, Sedicii and ViClarity. This means that Ireland ranks third in the world for regtech, ahead of fintech hubs such as Singapore, Hong Kong, Germany and France. Meanwhile in the payments space, only a few weeks ago we saw Atlanta-based EVO Payments announce their acquisition of Dublin’s Way2Pay, a payment solution for schools and clubs in the UK and Ireland, showing rising interest from US buyers in what Irish fintech has to offer. The Silicon Valley of Europe? Just the other day, I saw CBS San Francisco has labelled Ireland “The Silicon Valley of Europe”, thanks to the attention technology companies there are attracting from the Valley. There are 700 US companies with offices in Ireland, about a third of which are from Silicon Valley. Since 2016, there has been a 25% increase in companies from the West Coast setting up a European branch in Ireland and investment from the US is now at record levels, according to IDA Ireland. Valley Fintech software companies like Stripe (which of course has Irish founders) and PayPal have offices in Dublin. Signifyd is just another example of a successful Silicon Valley company that has set up in Ireland: in February, Signifyd set up their global R & D centre in Belfast, citing “product and engineering” as the skills the city is known for. Not surprisingly, at the event I also met leading US players in Fintech who are looking to open offices in Ireland and who are also interested in acquiring Irish and European Fintech companies. Some of these players are looking to acquire Irish companies to expand their presence into Europe. In my day-to-day conversations with major technology and finance firms here in the Valley, the sentiment is very similar: I hear a lot from people who are looking into setting up their European division in Ireland or considering an acquisition. Ireland offers a valuable gateway to Europe for US tech and financial services firms, which many are increasingly taking advantage of, choosing Dublin as their European base or innovation centre location, as well as looking to acquire or invest in the Emerald Isle. From what we see, tech businesses who are interested in what Irish fintech has to offer would do well to move quickly, as this market is heading for a surge in interest from foreign buyers and investors. Good news also for Irish fintech companies thinking about a sale or raising funding.